. Author : someworkout. 4611 views. The T25 workout is all about simplicity – simple workouts that you can complete in 25 minutes a day, over just 5 days of the week. That same philosophy transfers over to the Focus T25 nutrition guide. The first component of the T25 nutrition philosophy is that you should be eating 5 times a day. That means you need to eat in smaller quantities, but because of the frequency of meals and snacks, your metabolism is boosted and your blood sugar levels are more tightly regulated. What’s Inside The Focus T25 Nutrition Guide? Inside the T25 nutrition guide, you will find a short quiz. This is designed to determine how many calories you should be eating each day (and how to spread that out across your breakfast, lunch, dinner and snack times). 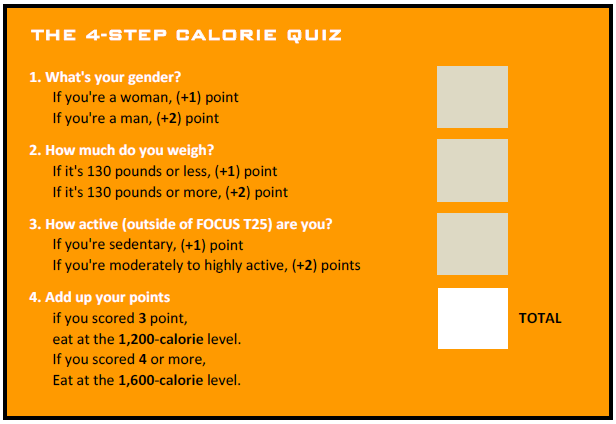 The way this quiz works is by assessing your gender, weight, and how active you are outside of T25. It’s only 3 questions, but T25 is all about simplicity. Not everyone has the time to make complicated calorie calculations and long workouts. Once you have completed this short quiz, you total your points and then you will be given a suggested calories per meal chart. What’s important to remember here is that we are keeping things simple. Don’t worry if you are a bit above or below the suggested calories. You can customize your meals too, depending on your goals. There are 25 recipes included in the plan. Some are more protein rich, and some are more carbohydrate rich. It is recommended that you start off your day with a protein-rich breakfast. You should also time your T25 workout so that you’ve had a carb-rich meal 2 or 3 hours beforehand. Protein is what fills you up, so a protein-rich snack before bed will help if you are hungry. If you find that you are hungry throughout the day, you can increase your calorie intake. Basically, nothing is set in stone and you should be tracking your progress so that if you make one change, you can measure the results. In terms of customization, if you are aiming to lose a lot of body fat, you can eat more protein heavy meals. If you are just looking to lose a few pounds of extra weight you may have put on, a few more carb loaded meals may help. It’s important that you eat enough to have the energy to get through the Focus T25 workouts each day. The great thing about the recipes is that, keeping in line with the T25 philosophy, they are all designed with simplicity in mind as well. Each recipe only requires 5 ingredients or less, and only takes 5 minutes to prepare. That’s a big thing and really goes a long way. Also, some recipes can be made ahead of time so you can prepare a lot of your food in batches and have them ready to eat on the go. There is variety in the food, and again you can customize the meals to meet your particular tastes. Throughout the recipe section are tips on how the nutrients in your foods benefit you. For example, how tomatoes are rich in antioxidants, which help fight off certain cancers. Or how onions are full of phytonutrients that help lower cholesterol and blood pressure. Related Articles to "FOCUS T25 Workout and Nutrition Guide PDF – Download The Calendar n Video"